For a touch of sophisticated glamour, a little gold shadow goes a long way. 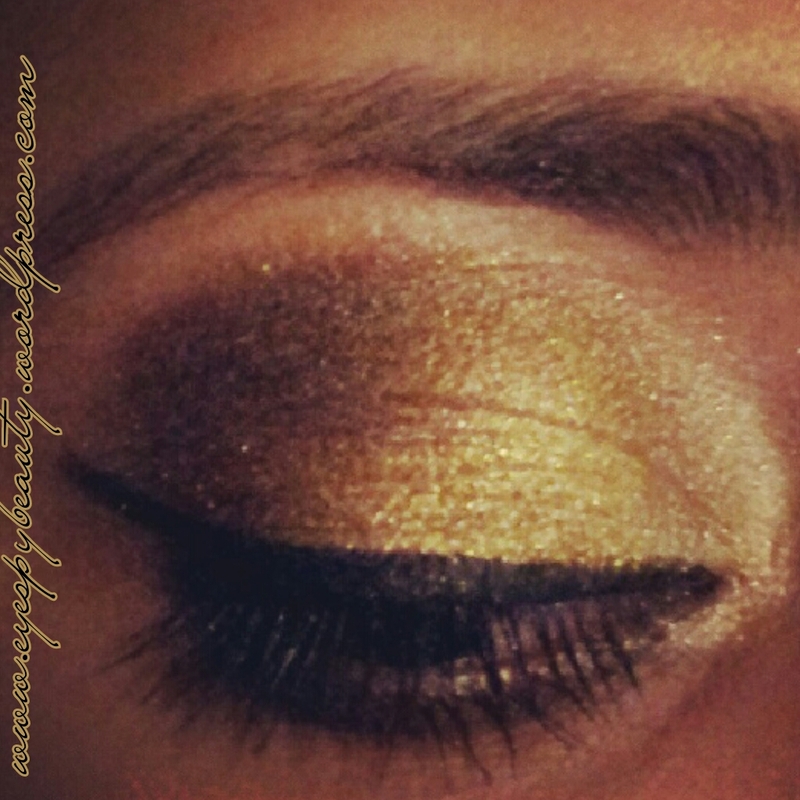 You can apply lightly for a wash of gold on the lids, as a liner, or as a highlight colour. Here are my top gold shadows tried and tested over the past year. I wore this with Urban Decay powder eyeshadow in Heat and Blackout as my own wedding eye look (see picture left). I have since worn it solo at weddings and parties and love it just as much. It’s so highly pigmented and is not too finely milled, so you can get a really good amount on the shadow brush. I spray setting powder onto brush, add shadow and then pack it onto my eyelids for maximum opacity. I then finish off with a spritz of fixing spray to keep it in place all day. 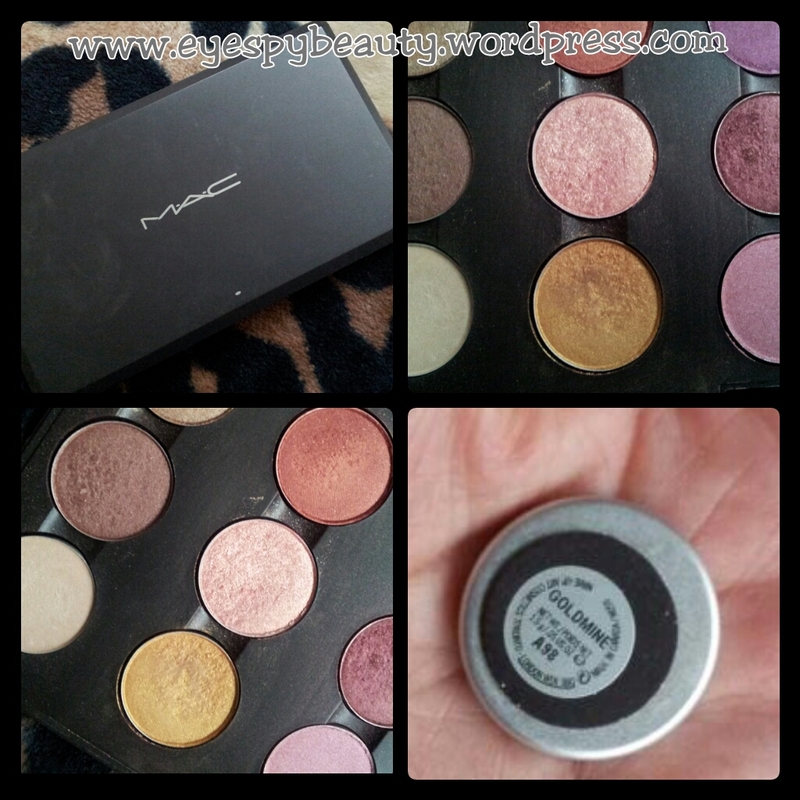 This is a regular MAC eyeshadow with the high quality you’d expect. It blends well and looks great when paired with the more browny/ coppery shades. I prefer my golds to look more 24ct rather than pale/ pewter gold, but if you want a wearable, light gold shadow, this is a great choice. I often use this as a highlighter or for inner corners of the eye. 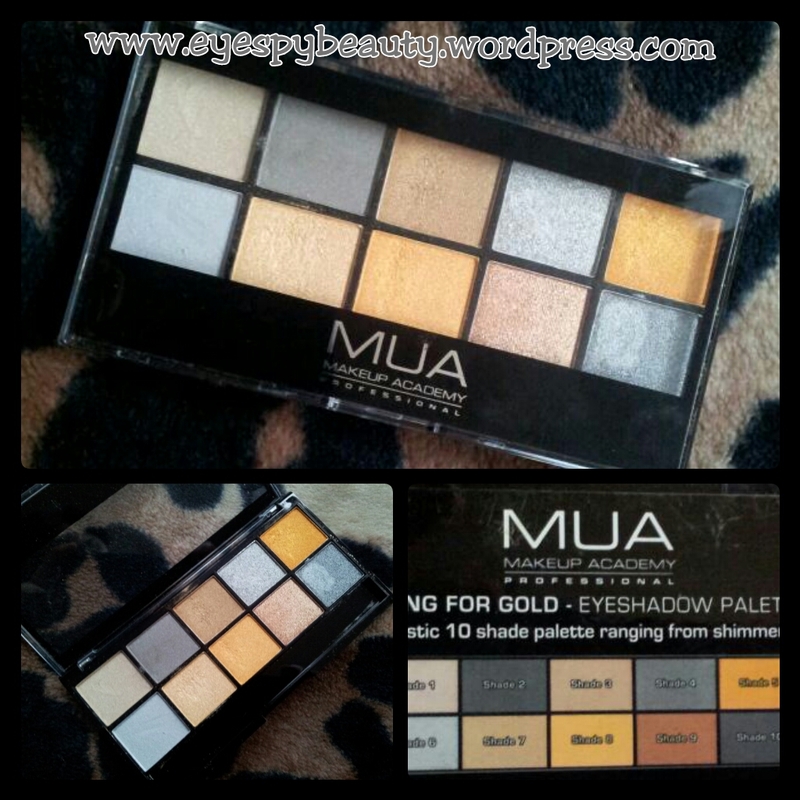 If you want multiple shades in the same palette, then MUA is the way to go. This palette cost me about £4 back in the summer 2012. It is cheap and cheerful and so has a significant amount of fallout. This can be controlled by spraying the brush with setting spray before picking up shadow. This is a very creamy formula that glides on smoothly for a satin/ almost gloss finish. As it’s so creamy, you need to let it dry fully so it sets on your lids and doesn’t slip around after a few hours. I gave one to my sister for an evening mehndi party. She hated it as it slid all over her eyelids throughout the evening. If you don’t have time to sit closed-eyed waiting for it to dry, you can of course, set it with powder shadow. As well as adding longevity, it will give you a more multi-dimensional look. I love this formula, as it’s so highly pigmented, and the best part is you get two golds in one, the first is more rich 24ct-look gold, and the second is a lighter pewter gold. 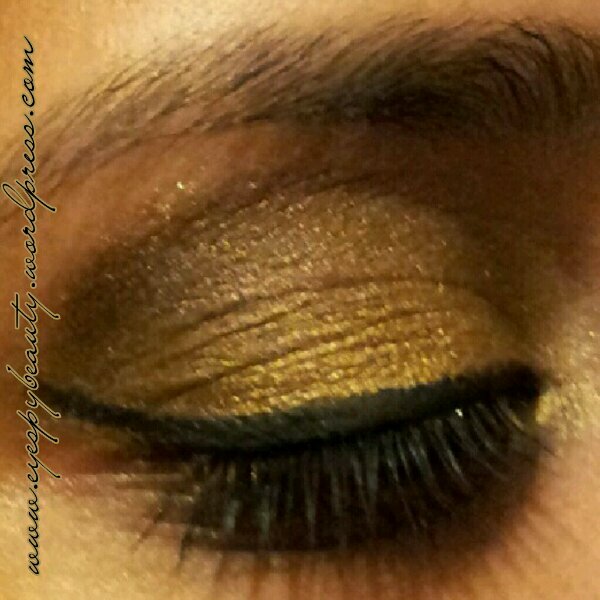 I use the rich Gold Leaf shade most often, and it looks great when layered with gold powder shadows from other Sleek palettes, or Urban Decay golds. I wore this eye look to a wedding back in December 2011, and built up the colour using mainly the Original palette, but borrowing colours from other Sleek palettes, to add dimension and depth to the colour. It was one of my favourite wedding eye looks of 2011. Noticed an obvious omission? Maybelline Colour Tattoo in Eternal Gold? To be honest, I wouldn’t buy it again. It’s the only Colour Tattoo I’ve been disappointed with. The glittery particles in the gold cream shadow stop it from being smooth and blendable. It isn’t creamy like the other shades, and just doesn’t blend well at all. I was really disappointed as I absolutely love. Colour Tattoo and I have ALL the shades, even some of the US-only shades. 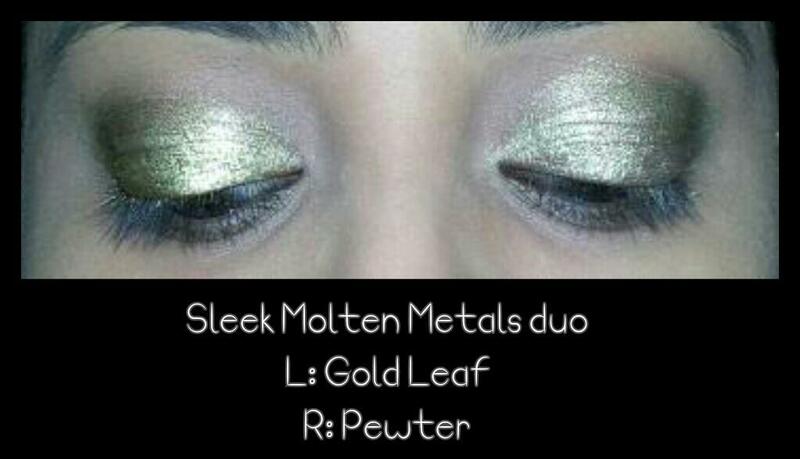 For gold eyeshadows, you’re better off with one of the above. Are there any you’ve tried and loved that I’ve missed? P.S. Don’t forget that today is DAY SEVEN of my 12 DAYS OF CHRISTMAS giveaway! Enter todays draw by posting a comment at the bottom of THIS POST. Make sure to tag it #12daysgiveaway and if you’re on Twitter, add your username (@….) here as well. First commenter = #1, Second = #2, etc and at 9am (UK time) the next morning I’ll draw a random number as the winner! Winner of day Six is Prihatini! Congratulations! Please email me on tasnimchowdhury@hotmail.com with your postal address! Leave a reply on "The best gold eyeshadows"